In the fall of 2004, Chroma™ relocated its manufacturing plant and offices to Big Springs Industrial Park in Maryville, TN. The new facility offers over 50,000 square feet of manufacturing and inventory space. 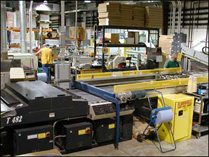 This additional space allowed Chroma™ to expand manufacturing into several new product lines.